Jim brings 19 years of design and management experience to the Skyway team. Dave has been in the grain handling and feed processing equipment industry for 35 years. John has 30 years experience marketing grain handling and feed systems throughout Alberta. Alan has been in the grain handling and feed processing sales and design industry for 21 years, 15 involved in direct sales to end user and 6 years as Sales Manager for a manufacturer of grain handling and processing equipment. Travis has 10 years of experience marketing grain handling & storage systems throughout Northern Alberta. After 10 years on the Skyway team Lubos has quickly learned grain handling and storage equipment. Fluent in English, Russian, German, and Slovak. Lubos is a valuable member of the Skyway team. Ellwood brings 32 years of design and management experience to the Skyway team. After 9 years with Skyway Barb has become a very important part of the Skyway team. 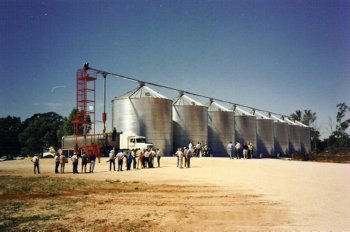 Barb very quickly learned the ins and outs of the grain handling and storage business. Barb oversees the accounting department and handles good part of the project management.